An unprecedented, unconventional symbol New interpretations dedicated to wood and all its forms, through workmanship, textures and colours. Soft tailored forms The colour of ultimate chic, lit up with a variety of shades, expressed in their forms by the design and bringing a new warmth. Light and resistant bar stool, counter stool, this furniture of restaurants gives an original, colored, cheerful and elegant touch even as kitchen stool in your kitchen area. Finish: Antico White / Blue Dimensions: H: 22-1/2" W: 30" D: 30"
Each environment is thought to receive each visitor with a mixing of elegance and comfort. An innovative, audacious and different concept which will be recorded in the mind of each customer. The simple lines and delicate decoration of a traditional stool allows it to harmonize with period, traditional, modern and design furniture and decor. Depending on constituent materials, this furniture is at home both indoors and out, in various rooms of the house, in gardens, on terraces, in bars and other environments. These pieces, practical and discreet, are manufactured of solid wood, stainless steel, chromed iron, aluminum and other materials. 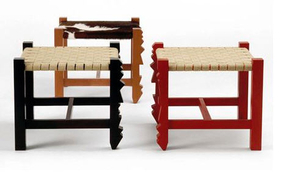 Some have backrests, especially commercial models for bars. Certain versions have a padded seat for added comfort.